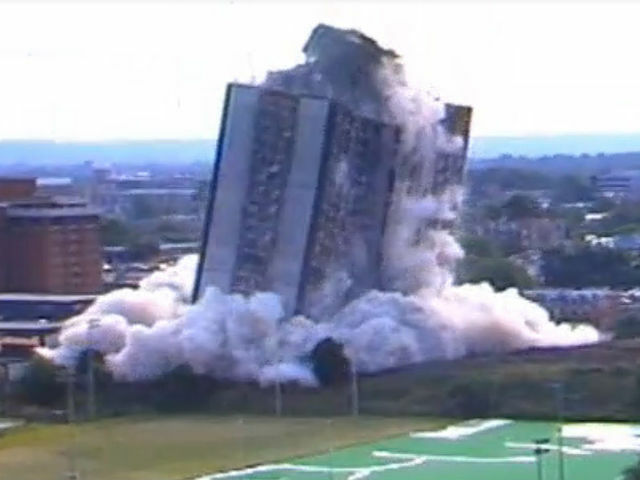 WATCH the Sander Hall implosion from seven WCPO camera angles in the video player above. CINCINNATI – If Bluto and Otter hadn't gone to Faber College and lived so famously in the Deltas' "Animal House," they might have felt right at home in Sander Hall at the University of Cincinnati during the 1970s. Bluto (John Belushi) might have kept himself amused pulling the fire alarm and laughing at residents trudging down the steps of the 27-story dorm – reportedly the second tallest in the country. * Or peeping in the coeds' mirror windows that somehow had been installed backwards. Or throwing M-80s down the trash chute. Otter (Tim Matheson) might have used the penthouse for toga parties (or maybe a "Death to Disco" party) after the residents replaced the lock on the doors with a lock of their own. The good-hearted pledges, Flounder (Stephen Furst) and Larry Kroger (Thomas Hulce), might have organized meals for the runaway kid who hid in the dorm for a week. The names have been changed here, but those are some of the "true stories" Sander Hall residents and administrators shared on a UC web site to mark the anniversary of the dormitory's implosion 25 years ago - June 23, 1991. At the time, Sander Hall was the tallest building in the U.S. to be imploded and the second tallest in the world, officials said. By some accounts, blowing up Sander Hall was the best thing that happened to it. Built for $12 million, it opened in 1971 and housed about 1,300 students each school year until 1982. It towered over Old St. George Church, in nearly the spot where the Sheakley Athletic Center and practice bubble are now. When it opened, Sander was like other co-ed dorms of its day, with the sexes segregated. Men lived on the top 12 floors and women on the bottom 12. The men had a great view – especially the ones who lived on the south side and had a picture-postcard look at downtown from the tallest point in Hamilton County. Women complained and eventually the residents were assimilated. The elevators were often out of order, but that was just an inconvenience. Danger lurked from asbestos, and Sander was a fire trap – there was no sprinkler system. After a sixth-floor room caught fire in 1981, UC closed the dorm in 1982 and left it vacant for almost 10 years. In 1991, architects working on a master plan for "humanizing" the campus recommended tearing it down and replacing it with a park. It would have cost $20 million to renovate Sander and bring it up to code, UC officials said. It cost about $3 million to implode it. So, on a sunny Sunday morning, thousands of students, alums, families and the curious gathered on the campus, nearby streets and rooftops to watch the big event. Police blocked streets 600 feet from ground zero. Many people picked a viewing point south of Sander, expecting the usual winds from the west and south to blow the huge cloud of concrete dust east and north. The countdown started just before 8:35 a.m. and the crowd joined in – "10, 9, 8, 7 … " At zero, there was one loud boom followed by another and another as 500 pounds of explosives blew out the building supports. The floors neatly crashed down into the center in a pile without causing any damage to adjacent buildings. Not even a broken window, the demolition manager said. But the wind shifted, and pandemonium ensued. The huge, orange-yellow dust cloud appeared to blow in every direction – notably south, first engulfing the viewing area reserved for VIPs and their families. It looked like the Faber College homecoming parade as many tried to outrun it. But there was no escaping it. However, the cloud dissipated quickly. There was a lot of coughing and irritated eyes, but no injuries were reported. The implosion took all of nine seconds and left 30,000 cubic yards of debris, but it was so "clean" that the supervisor from O'Rourke Construction said removing the mess might take seven to 10 days fewer than expected. The Deathmobile could not have done it more effectively. * In 1969, Illinois State University opened the tallest dorm in the U.S. 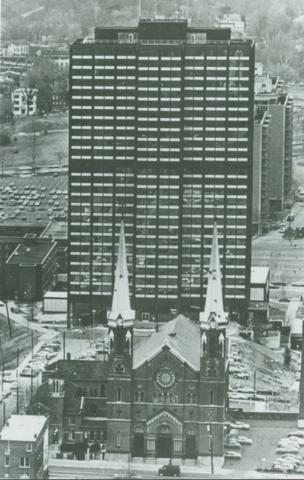 The 28-story Watterson Towers - one story higher than Sander Hall - is still in use. In 2015, Pace University opened the tallest dorm in the world – 34 stories – in Lower Manhattan with "spectacular views of the new World Trade Center and the East River." SEE other videos and stories about Tri-State history in our "From The Vault" series.